This truly unisex pattern offers opportunities to be created as a tough shirt for a little or big guy or a super girly one with a frilly neckline and cute heart pockets for a girl. So many options are included! Because plackets are often deemed ‘scary’, very thorough, step-by-step beginner’s explanations have been included so that everyone, you too, can create a neat, professional looking front placket and a perfectly finished neckline! You will learn all my tricks of the trade to get a perfect and crisp placket. This is the fastest and easiest placket in the world! Additional instructions to repurpose or upcycle unwanted shirts are included. The best thing about this pattern is that it allows you to mix and match prints and fabrics to your liking. You are only limited to knit for the main shirt and sleeves; most of the other details, collars, placket, pockets and hood can be created out of both woven and knit! You can showcase your most precious scraps you have held onto as a sweet pocket or collar. With both long sleeve and short sleeve options in this pattern, a polo shirt for every occasion can be created! Although a polo shirt is an easy-fitting shirt, instructions have been included to make the shirt more fitted, exactly to your liking – while sewing, I will show you how to make either an easy-fitting shirt, or a more fitted shirt. There are so many ways you can create this pattern, as there are so many options included! Four neckline options: A ruffle collar, a regular collar, a Henley collar, and a hood. 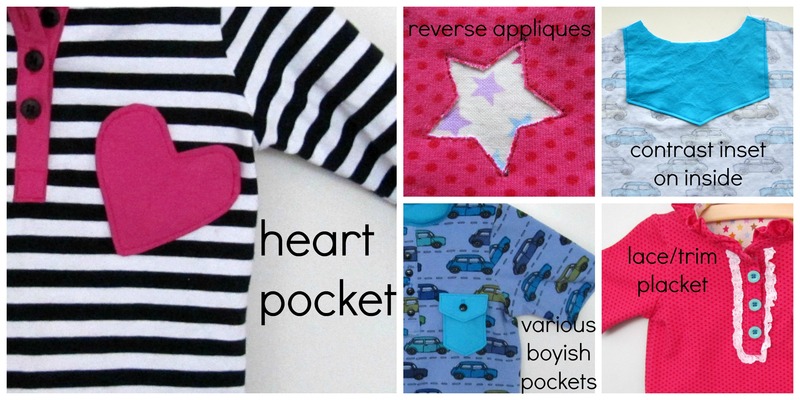 Various pockets, both for boys and girls (a heart pocket is something every girl would love to collect her treasures in!). Thorough instructions and additional pattern pieces for reverse appliques. An optional contrast inset on the inside of the shirt for extra detail and to give your shirt even more of a professional look and an optional cute lace/trim placket. A chapter in the pattern is devoted to other ideas and inspiration to create even more different looks with this pattern. This super versatile and timeless pattern comes in such a huge size range, from 6m through 14y, that you will be absolutely certain to always have a go-to shirt pattern as a staple in every child’s wardrobe. Because of the many options that make this shirt boyish or girly, coordinating brother-sister outfits would be easy to accomplish! This pattern can be dressed up or dressed down for getting dirty or even a nice dinner. Basic sewing skills are all you need to create a professional-looking shirt. Tips and tricks for sewing with knits are included in the pattern. This pattern is suitable for the curious and adventurous beginner that is looking for growth!